Do you like hooks, horns, and teeth ? In 1974 Orville Fay introduced a tetraploid daylily named Green Fringe that he hybridized in the late 1960’s. I not being around in daylilies at that time, wonder what Orville must have thought when he saw fringe and teeth on his daylily. 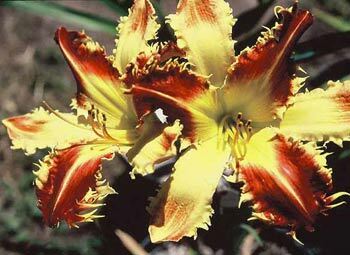 The grand parent of Green Fringe, Golden Surrey was already making its mark in teeth daylily history. Mr Fay would be pleased today. Hybridizers all across the USA and Canada are now focusing part of their hybridizing efforts on daylilies with teeth, fringe, fangs, claws, hooks, hair, horns, and combinations of these characteristics. Several daylilies have proved instrumental in the advancement of these characteristics. The daylilies are Tetra Spindazzle, Forestlake Ragamuffin, Startle, and Fortunes Dearest. Each daylily has their own unique story that I’ll share with you in upcoming blogs. Photo an image of a John Benz future. This entry was posted in Daylily Hybridizing, Seedlings and tagged Forestlake Ragamuffin, Fortunes Dearest, Green Fringe, Oville Faye, SPINDAZZLE, Startle. Bookmark the permalink.